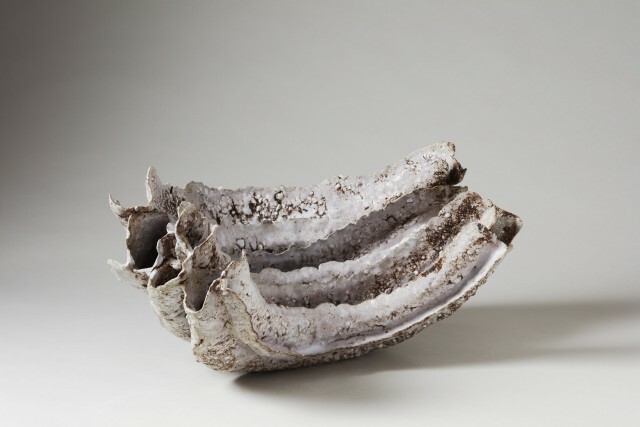 Bev Bell-Hughes "When I was at art school in the late sixties I wrote my final paper thesis, on the relationship between natural forms and clay. But it is only since 1978 when I moved to Wales to live, that I have developed ideas in my work related directly to where I live. I live between Conwy and Llandudno and have the benefit of being near to Snowdonia and the mountains. I also live near the river estuary of Conwy, and spend a great deal of time, when I have it, on Deganwy and the Morfa beach. Each day is a journey of looking and experiencing natures change, of how mother earth presents herself to the world. Marks left in the sand by the receding tide,sharp and clear ,to deep gullies or smooth. Items thrown up by the tide,battered by storms. Different sea weed flowing in ribbons. The erosion of surfaces be they shells ,rocks, driftwood or bone. The work is bisque fired in an electric kiln to 980degrees C and glaze fired in a gas kiln to 1300degrees C. A barium glaze is used with various oxide washes underneath to create colour. My work is made using flattened coils of clay into which other materials are added to change the surface texture, clays and sands. The work is pushed and pinched causing crators and holes. The work has a strong tactile quality, as does the natural world. I don't wish to imitate nature but aspire to echo the process."